Someone on Twitter shared a post about “how to memorize a random 60-bit sequence”. 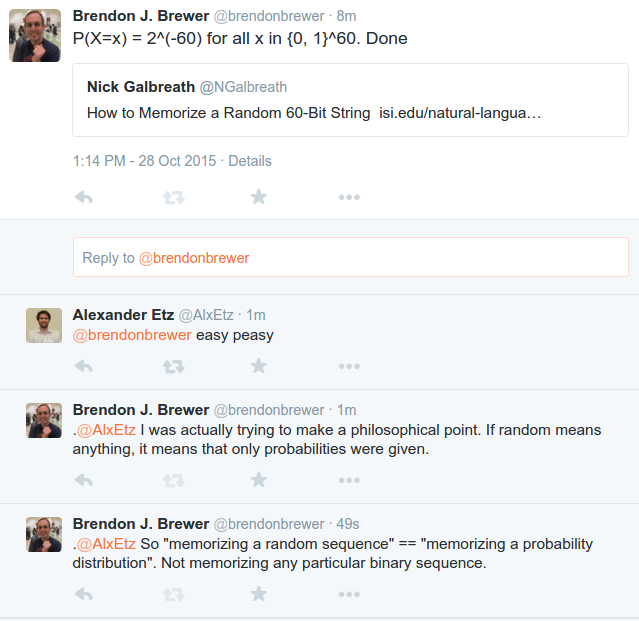 Without reading the post, I decided to use this as an opportunity to explain what randomness actually is. I generally avoid the term myself because it usually a source of confusion rather than understanding. However, it is sometimes used in mathematical writing in a way that makes sense, while having little to do with popular conceptions of randomness which involve “jiggling about” or “looking shuffled”. Here is the relevant series of tweets (click to embiggen). This entry was posted in Uncategorized and tagged random numbers. Bookmark the permalink.